Authorization has been given for tomorrow’s Arianespace Soyuz launch from French Guiana, providing the “all clear” for this medium-lift mission that will orbit a telecommunications satellite for European-based operator SES. Preparations for Flight VS17 included the placement of decals for satellite operator SES on the Soyuz launcher’s protective payload fairing. The approval was granted today after the regular pre-launch review for Arianespace flights – which confirmed the readiness of Soyuz and its SES-15 satellite passenger, the launch site and associated infrastructure at the Spaceport, as well as the network of downrange tracking stations. The May 18 mission – designated VS17 in Arianespace’s numbering system – will be performed from the purpose-built ELS launch facility for Soyuz. Liftoff is scheduled at precisely 8:54:53 a.m. local time in French Guiana, with SES-15 to be deployed during a flight lasting approximately 5 hrs., 18 min. 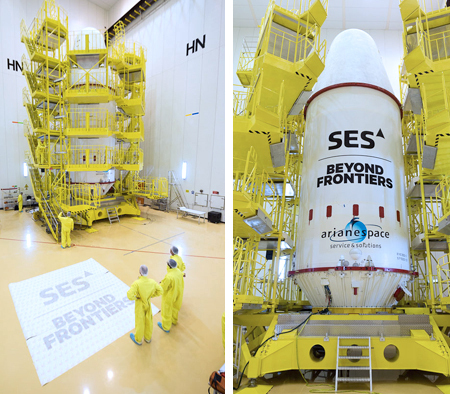 Built by Boeing, SES-15 will be the 40th spacecraft orbited by Arianespace for long-time customer SES. It has an estimated liftoff mass of 2,302 kg., while the mission’s total lift performance to geostationary transfer orbit is set at 2,447 kg. – taking into account the payload integration equipment and other hardware. SES-15 is to be operated by SES from an orbital position of 129 deg. West, with the satellite offering extensive coverage over North America, Mexico and Central America – stretching from Arctic Alaska to the South of Panama, and from Hawaii to the Caribbean. Flight VS17 will be Arianespace’s fifth mission performed so far in 2017 (following two using the heavy-lift Ariane 5, and one each with the medium-lift Soyuz and lightweight Vega), as well as the 17th Soyuz liftoff performed from French Guiana since this vehicle’s 2011 introduction at the Spaceport.